Buying a home can be a long and stressful process for all parties, but Geovation Programme participant Thirdfort is hoping to make it significantly easier for everyone following a £400,000 pre-seed funding round led by Alex Chesterman (founder of Zoopla) and Lawyer Checker (leading legal anti-fraud specialist). Entrepreneurs and friends Olly Thornton-Berry and Jack Bidgood started their first business together at Durham University. 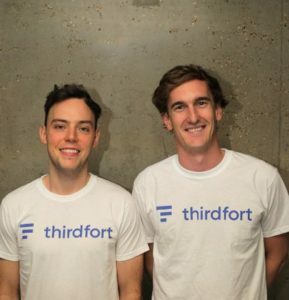 Last year they founded their latest business, Thirdfort, after a mutual friend was defrauded out of £25,000 while buying a flat. Olly and Jack’s mission is to use technology to revolutionise the home moving experience and the transfer of funds. HM Land Registry reports that property fraud has increased 20-fold since 2015, and Thirdfort research suggests property professionals are spending more time and money on manual preventative measures that create an added layer of stress for lawyers and home movers. The end result is that during property transactions, clients of lawyers using Thirdfort receive a more secure and transparent digital transaction experience. To find out more about Thirdfort, visit their website. For Geovation updates, follow us on Twitter.